The Tour De France Stage 3, promises to be a great occassion as the leading names in world cycling compete for the famous yellow jersey on London’s streets. After leaving Cambridge, passing through Essex, the tour will arrive in Greater London via Epping Forest. 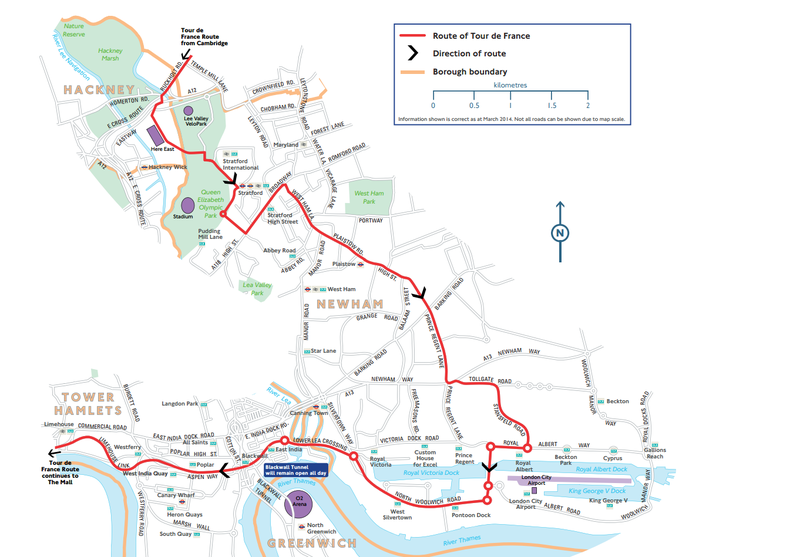 The tour will cycle through the Olympic park, through Stratford town centre and then down into Royal Docks entering at Stansfeld Road. It will continue by crossing the Connaught bridge which crosses Royal Victoria and Royal Albert docks and will surely give some spectacular camera shots of the wharf and the Excel centre. The route then passes along Silvertown way and past Pontoon Dock and West Silvertown DLR stations before heading towards Canary Wharf by the Lower Lea crossing. There will be some temporary road changes on the day and the event route will be closed to traffic from 10:00 on Monday 7th to ensure the safety of competitors and spectators. As such there will major impact on the road transport and bus journeys. According to TFL roads will be opened as soon as possible after the race, from 18:00 in most cases. If you are looking for a hotel close to the Tour de France Stage 3, then check out our hotels page. So we look forward to welcoming the tour de France riders to Royal Docks and for a British stage winner! !